Researchers are turning leftover grape skins from winemaking into novel, 3-D-printed objects. 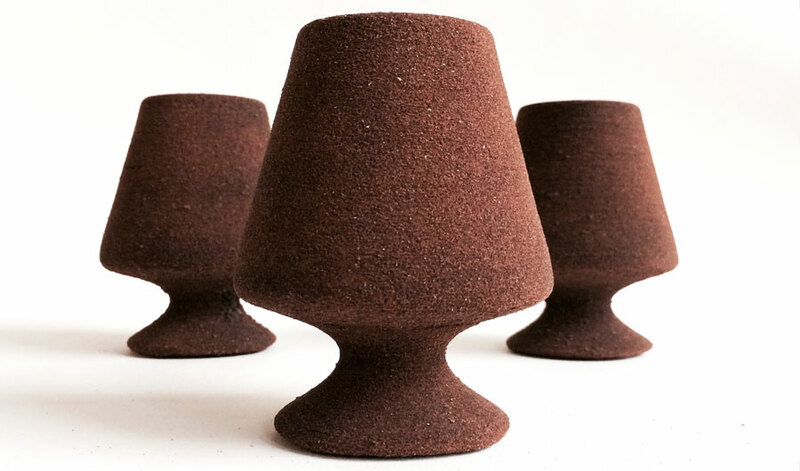 (Inside Science) -- These shapely chardonnay goblets were once wine industry waste. Hot off the 3-D printing press of Ronald Rael, an associate professor of architecture at the University of California, Berkeley, the glasses are 67 percent grape skins, leftovers from the fruit-to-booze process. The design is more wit than working drinking vessel. The glasses are currently coated with a sealant designed for dry food, and have not yet transported wine to thirsty lips. Rael and his colleague Virginia San Fratello made them to demonstrate how used grapes might find new life as a versatile building material. Each year, California wineries alone generate more than 100,000 tons of solid remains from crushed grapes. Rael spoke briefly about the grape skin material as part of a larger presentation on 3-D printing and architecture at the American Association for the Advancement of Science meeting, held in Boston this February. His team has also turned salt, sand, sawdust and other locally available, recycled, or waste materials into 3-D-printed building blocks. The researchers are constantly seeking new materials to 3-D print sustainably and cost-effectively, Rael said. And that's a goal you could lift a glass to.